Redline Xtreme Energy Drink is a more caffeinated version of Redline RTD Energy Drink. It is labeled as two 4 floz servings per bottle, but above we have listed the caffeine amount in a whole bottle. 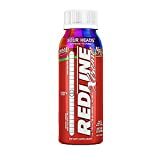 Besides caffeine, Redline Xtreme Energy Drink contains additional stimulants, so caution should be used even by those with a strong tolerance to caffeine. This product is not suitable for children or those sensitive to caffeine. How Does Redline Xtreme Energy Drink Compare? Redline Xtreme Energy Drink contains 39.50 mgs of caffeine per fluid ounce (133.57mg/100 ml).